Do you ever want to try a new food but you don’t know what to do with it? That is the way I have always felt about lentils. Not so fast! Don’t go anywhere yet. You don’t even know anything about them yet! I know (especially in green) that they aren’t the prettiest legume but it turns out my hunch was spot on. They are hearty and delicious! And as luck would have it they go great with this salmon. I am actually not a huge salmon fan but this is one of my favorite ways to make it. In addition to being healthful this recipe has complex flavors that really play nicely together without being overwhelming. It is a great way to start out a week where perhaps you indulged all weekend. I wouldn’t know anything about weekends like this but I hear they can be quite excessive. It’s fast too. Did I mention that? I did have to go to The Fresh Market to find canned lentils. It would take much longer if you had to soak the lentils and such. So if you haven’t ever had lentils but you wonder about them too, try this. You won’t be sorry. Heat broiler, with rack set 8 inches from heat. In a large broiler-proof skillet, heat oil over medium-high. Add onion and cumin and cook, stirring, until onion is golden, 8 minutes. Meanwhile, rub mustard on salmon and season with salt and pepper.Add lentils to skillet, stir, and season with salt and pepper. 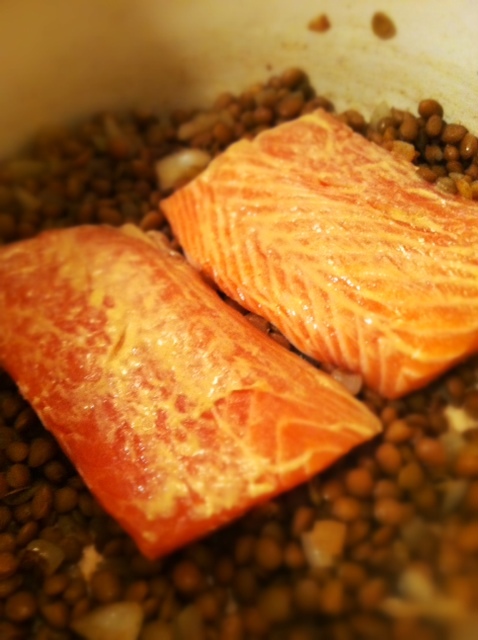 Nestle salmon in lentils and broil until opaque throughout, 5 to 8 minutes. Sprinkle with cilantro and serve. 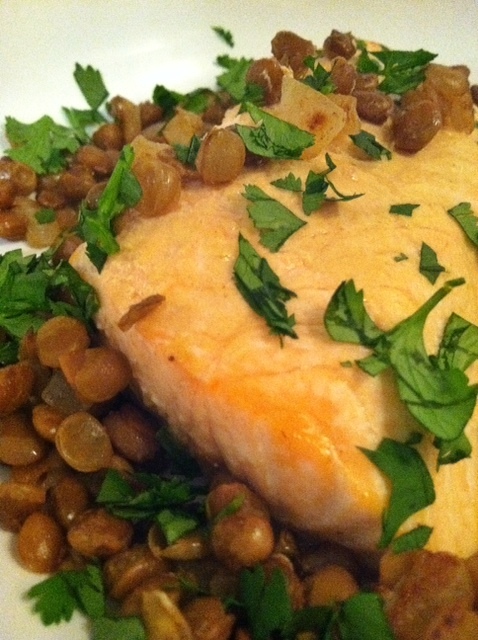 I love lentils, but have never had them with salmon! Can’t wait to try it! !